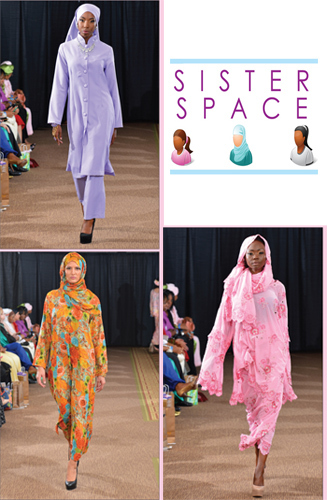 Models wear colorful modest clothing for Muslim women designed by Queen Aminah Muhammad. WASHINGTON - Aminah Muhammad known across the Nation of Islam for styling women and men including the Honorable Minister Louis Farrakhan, showcased for debut, her designs during D.C. Fashion Week’s (DCFW) Haute and Modesty Show, this fall. “I had the experience of a lifetime. It was amazing! There were Islamic Fashions from around the globe. I was able to see an international perspective of Islamic fashion,” she told The Final Call. There is a world demand for Muslim fashion. If we only focus on women, we are talking about at least 800 million people. And 40 percent of that, or 320 million, is 25 years old and under “the spending group” Some Muslim designs can sell for as much as $10,000 and yet remain in high demand due to the robust economies of key markets such as the United Arab Emirates. A Dubai-based company in fact sells Abayas (dresses) costing between $1,500 to $10,000. Debbie Wingham released the most expensive dress in the world last year at $17 million and it was in fact—a diamond studded Abaya. This was the third Haute and Modesty Show featuring these designs. “We are delighted to be the first major entity in North America to provide a highly visible platform specifically for modest fashion designers,” said Ean Williams, creator and executive director of DCFW. Internationally recognized DCFW is a partnership of independent fashion designers, producers and models. It is the fastest growing international fashion week exhibit in the world as it now reaches an audience of more than 10 million per event. Areej, a lifestyle organization that creates events for Muslim women, produces the Haute and Modesty Show. “We were very excited to return with new designers, incredible fashions and another opportunity for women to see the options they have in dressing. We know dressing modestly is beautiful and we want our guests to see it,” said Baqiyah Adam, Areej’s Director of Designers. In addition to Queen Aminah Designs, the show featured international designer Sanriq Stylez, trendy fashionista Tru Designs by Deana, Primo Moda modern designs, Eman Apparel from Canada, Ajmaan from South Africa, Styles by Hakeemah and famed Indonesian designer Dian Pelangi making her American debut. DCFW has started a trend with modest fashions that seems to be catching on. For the first time last winter Philly Fashion Week also had a show dedicated to modest fashion and talks are underway to take the concept of modest fashion shows across the country. “I pray to continue to grow and cultivate my creative skills in designing and fashion, which is an excellent way to propagate the faith of Islam,” said Mrs. Muhammad. “Fashion is your Faith, the way you dress represents your beliefs. Insha’Allah (God-willing) my new line will emerge spring of 2015 called ‘Aminah’s Couture’. I’m calling all West Coast Islamic Fashionistas! Let’s organize a modest fashion week spring of 2015 in Los Angeles, California.” D.C. Fashion Week returns February 18-22, 2015.